Amazon CloudFront, AWS Shield, AWS Web Application Firewall (WAF), and Amazon Route 53 work seamlessly together to create a flexible, layered security perimeter against multiple types of attacks including network and application layer DDoS attacks. All of these services are co-resident at the AWS edge and provide a scalable, reliable, and high-performance security perimeter for your applications and content. With CloudFront as the “front door” to your application and infrastructure, you are moving the primary attack surface away from your critical content, data, code and infrastructure. Learn more about AWS Best Practices for DDoS Resiliency. With Amazon CloudFront, you can deliver your content, APIs or applications via SSL/TLS, and advanced SSL features are enabled automatically. You can use AWS Certificate Manager (ACM) to easily create a custom SSL certificate and deploy to your CloudFront distribution for free. ACM automatically handles certificate renewal, eliminating the overhead and costs of a manual renewal process. Additionally, CloudFront provides a number of SSL optimizations and advanced capabilities such as full/half bridge HTTPS connections, OCSP stapling, Session Tickets, Perfect Forward Secrecy, TLS Protocol Enforcements and Field-Level Encryption. With Amazon CloudFront, you can restrict access to your content through a number of capabilities. With Signed URLs and Signed Cookies, you can support Token Authentication to restrict access to only authenticated viewers. Through geo-restriction capability, you can prevent users in specific geographic locations from accessing content that you're distributing through CloudFront. With Origin Access Identity (OAI) feature, you can restrict access to an Amazon S3 bucket to only be accessible from CloudFront. Learn more. CloudFront infrastructure and processes are all compliant with PCI-DSS Level 1, HIPAA, and ISO 9001, ISO 27001, SOC (1, 2 and 3) to ensure secure delivery of your most sensitive data. Web applications often need to contend with spikes in traffic during peak periods of activity. 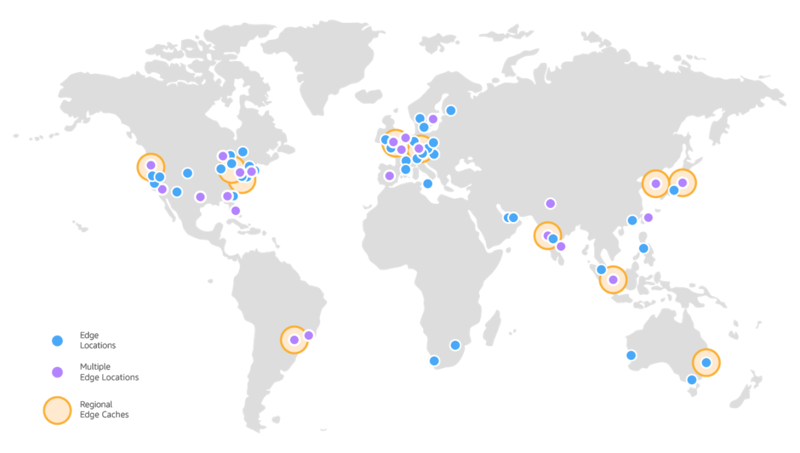 By using Amazon CloudFront, you can cache your content in CloudFront’s edge locations worldwide and reduce the workload on your origin by only fetching content from your origin when needed. This reduced workload on your origin helps you increase the availability of your application. CloudFront also allows you to set up multiple origins to enable redundancy in your backend architecture. You can use CloudFront’s native origin failover capability to automatically serve your content from a backup origin when your primary origin is unavailable. The origins you set up with origin failover can be any combination of AWS origins like EC2 instances, Amazon S3 buckets, or Media Services, or non-AWS origins like an on-premises HTTP server. Amazon CloudFront is continuously measuring internet connectivity, performance and computing to find the best way to route requests to our network; taking into account performance, load, operational status, and other factors to deliver the best experience in real-time. Amazon CloudFront is also running on the AWS global network backbone, that allows for efficient transmission of requests between the CloudFront Edge locations and otherAWS services, across regions and applications. Network-layer optimizations such as TCP fast open, request collapsing, keep-alive connections and much more, enable the Amazon CDN to accelerate both static and dynamic content for improved user performance. Modern websites and applications are a rich mixture of dynamic, personalized and static content. Microservices also expose increasing numbers of APIs and requests between components. Amazon CloudFront is optimized for both, providing extensive flexibility for optimizing cache behavior, coupled with network-layer optimizations for latency and throughput. CloudFront supports the WebSocket protocol as well as the HTTP protocol with the following HTTP methods: GET, HEAD, POST, PUT, DELETE, OPTIONS, and PATCH. This means you can improve the performance of dynamic websites that have web forms, comment and login boxes, “add to cart” buttons, WebSocket-based applications, or other features that upload data from end users. It also means you can now use a single domain name to deliver your whole website through CloudFront thereby accelerating both the download and upload parts of your website. As the global network infrastructure has grown and improved, cache retention has emerged as a key contributor to performance. The content delivery network (CDN) is architected to keep objects longer in cache and to reduce cache churn. Techniques like tiered caching and de-duplication optimization of objects in cache help maximize cache retention. Amazon CloudFront provides developers with a full-featured API to create, configure and maintain your CloudFront distributions. In addition, developers have access to a number of tools such as AWS CloudFormation, CodeDeploy, CodeCommit and AWS SDKs to configure and deploy their workloads with Amazon CloudFront. Your CloudFront Distribution can be configured with multiple behaviors which govern how CloudFront will process your request and what features will be applied. Take control of how CloudFront caches, how CloudFront communicates with your origin, customize what headers and metadata are forwarded to your origin, create content variants with flexible cache-key manipulation, support for various compression modes, and other customizations. With built-in device detection, CloudFront can detect the device type (Desktop, Tablet, Smart TV, or Mobile device) and pass that information in the form of new HTTP Headers to your application to easily adapt content variants or other responses. Amazon CloudFront can also detect the country-level location of the requesting user for further customization of the response. With Amazon CloudFront pay-as-you-go pricing, you pay only for what you use. There is no minimum fee. For customers who are willing to make certain minimum traffic commitments, we also offer private committed pricing. Learn more about Amazon CloudFront pricing. If you use AWS origins such as Amazon S3, Amazon EC2 or Elastic Load Balancing, you don’t pay for any data transferred between these services and CloudFront. To learn more about all Amazon CloudFront features and how to configure them, please refer to the Amazon CloudFront Developer Guide.